The Hyper V-Core Series is the newest to the Koyorad All Aluminum Racing Radiator line up.An engine’s cooling system in many newer vehicles are suffering due to limited space and crowding which affects air circulation.Our new ultra efficient Hyper V core was developed specifically for vehicles which see extreme heat, are limited in space, and where the factory inlet/outlet locations eliminate the option for a proper N-FLO design. The Hyper V Series radiators have a specially designed fin and tube pitch which significantly increased its surface area while still allowing for excellent air circulation through the radiator.The Hyper V-Core series is the perfect solution where space savings and high performance is a must. 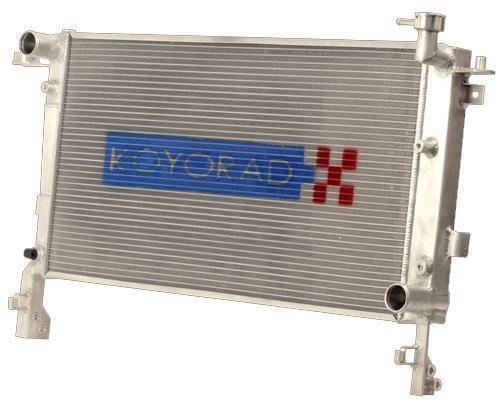 All Koyorad Hyper V-Series All Aluminum Radiators are Nocolok brazed, designed as a factory fit, direct bolt in with no engine modifications necessary, and retain mounts for thestock fan shrouds and fans.